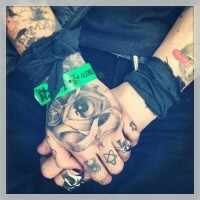 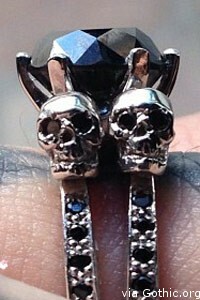 Remember the Deadmou5’s infamous twitter proposal to the LA Ink-credible Kat Von D, with the promise of having it reset with a black diamond? 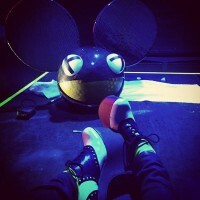 At long last deadmau5 has delivered on his promise on December 23. 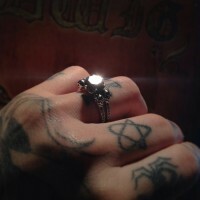 Von D tweeted, “Tonight, Joel put a ring on my finger — Too taken aback by its beauty and its meaning to post a pic right now,” and posted pics a while later tweeting, “Doesn’t get any more official”. 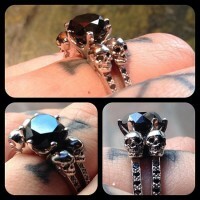 As expected the ring is perfect for the tattooed lady, with the gorgeous black diamond taking center stage, as well as matching diamonds on the band. 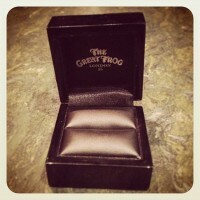 The ring was made by the Great Frog of London.